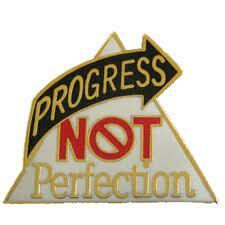 Life is about progression, not perfection. No one expects you to be perfect and, in fact, they know you won't be. If they demand this from you, they are either an imbecile, or are trying to push you further along in your progression than you are pushing yourself. As long as you are moving forward, even if the tiniest little steps, you are moving the right direction. Don't let anyone tell you otherwise. "We don't need to get a complex or get a feeling that you have to be perfect to be saved. You don't. There's only been one perfect person, and that's the Lord Jesus, but in order to be saved in the Kingdom of God and in order to pass the test of mortality,what you have to do is get on the straight and narrow path – thus charting a course leading to eternal life – and then, being on that path, pass out of this life in full fellowship. I'm not saying that you don't have to keep the commandments.I'm saying you don't have to be perfect to be saved. If you did, no one would be saved." Beautiful, Melissa! Thank you! I found this topic when I was researching for my "Happiness" talk and have found that it is shared time and time again by Ecclesiastical leaders of all kinds. I love this reassurance.